Today I fitted all of the tenons back to their original sockets and made them snug as they should have been. I also added a pair of rails 3” below the long top rails. My joints were as tight as always and you can see that they hold the frame very well. This serves to add the strength I would have got had the top rail been wider. I will add a shelf here for book storage and such; perhaps a good place to stow my drawing board and tee square. It strengthened the overall carcass tremendously by the time it was all done and now I can sating and finish the unfinished parts to the golden oak colour. Beyond that I just need to turn some new knobs for the drawer and the support pulls and my work will be done. 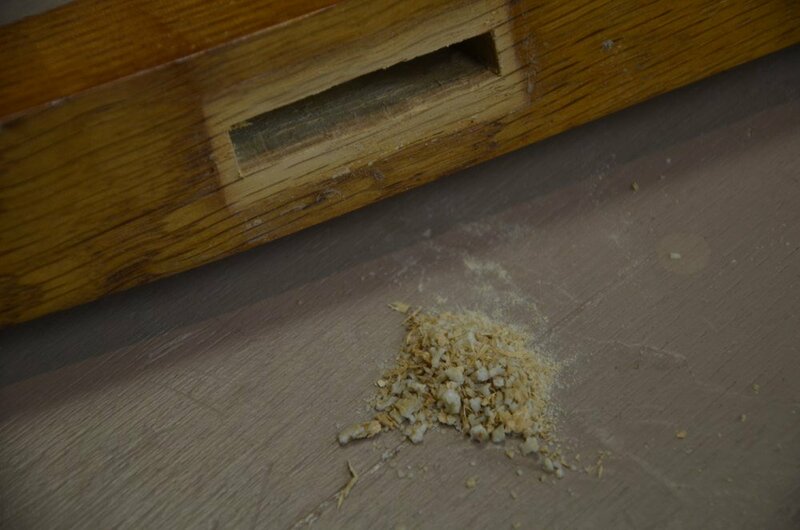 This is the crystallised glue scraped from the mortise hole. Here is a comments question someone asked and I thought my answer might add more light for consideration. Out of interest, I’ve used Cascamite on a couple of projects in the past, none of which are 70 years old, obviously. The adhesive is known for setting glass hard, and glass brittle, hence in the boat building trade it’s only used where it can be backed up with a secondary mechanical fix, such as a screw. Otherwise it’s epoxy resin and not much else. In your experience is this failure more to do with poor joinery or would the glue have failed in this manner over time regardless? Good question, Jon. I noticed that all of the joints had failed in some measure. That’s 14 mortise and tenons. 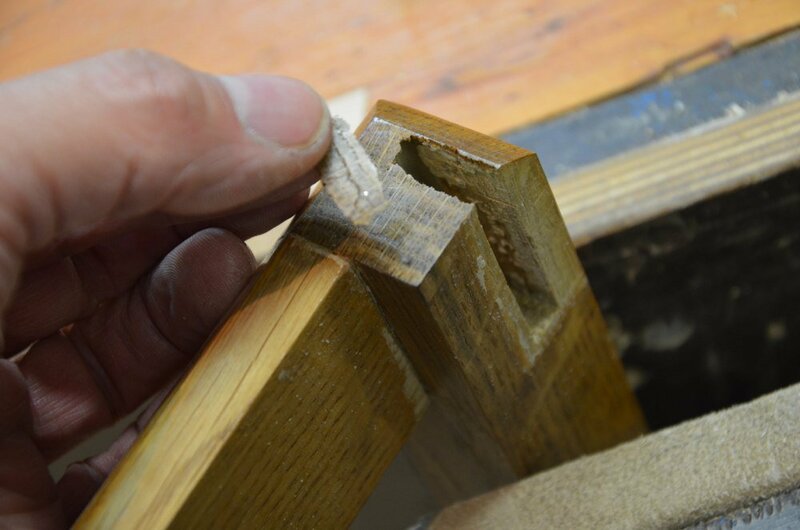 The reasons may vary but one thing I did feel was that shrinkage in a tenon can split along the glue line if the mortise wood is not moving or shrinkage taking place at a parallel rate and time. In other words both sections of wood should be dry to the same level at the point of union. 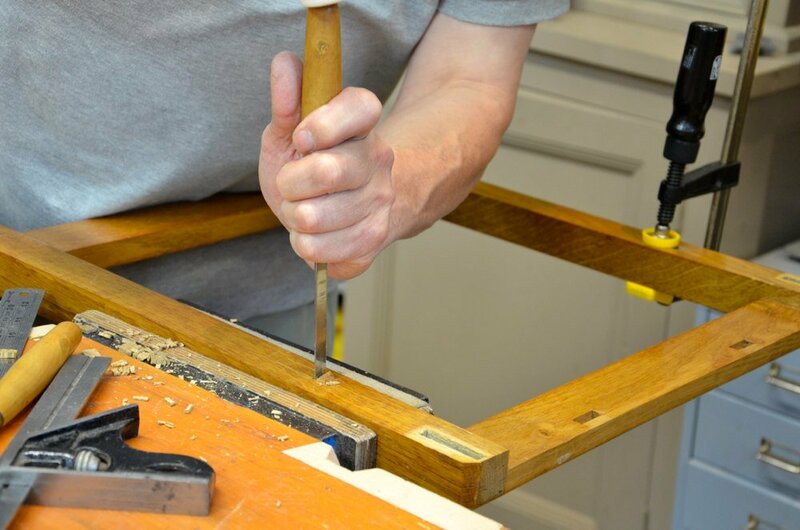 If tenon wood is drier than mortise wood that would be fine, but we furniture makers generally use wood from the same batch and uniform in moisture levels. These joints were surprisingly poor even though the actual forming of them was very good. I repaired and glued up the whole framework this evening and was very happy with the eventual outcome as I left for home. All in all it was the joinery I felt contributed most to the failure, and though there is of course something of value in using glues that allow splitting on the glue line for repair work to take place, for new and non-conservation furniture work I will continue with PVA and/or animal glues and perhaps use the Cascamite for outdoor work. Then again, I think that the newer PVA waterproofs seem to be holding their own these days. Here you can see a design flaw or a wrong decision on the part of the maker. 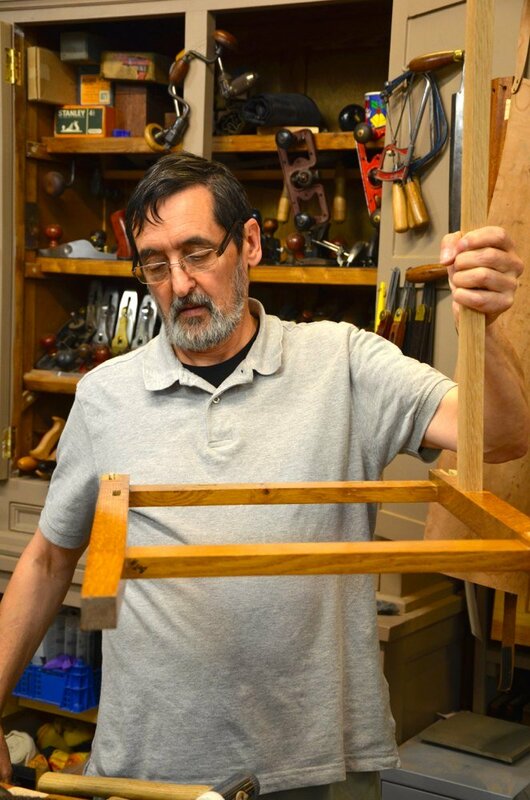 I conclude what happened was that he made the mortises keeping extra length on until after glue up and then cut the length down flush with the tops of the aprons. 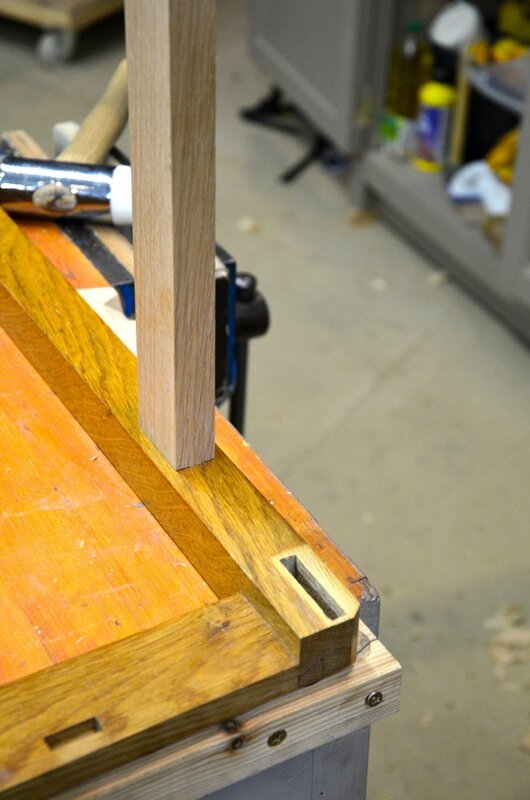 He allowed only 1/8” between tenon top and leg top. Not really enough. He bevelled the top corners after cutting the legs to final length. 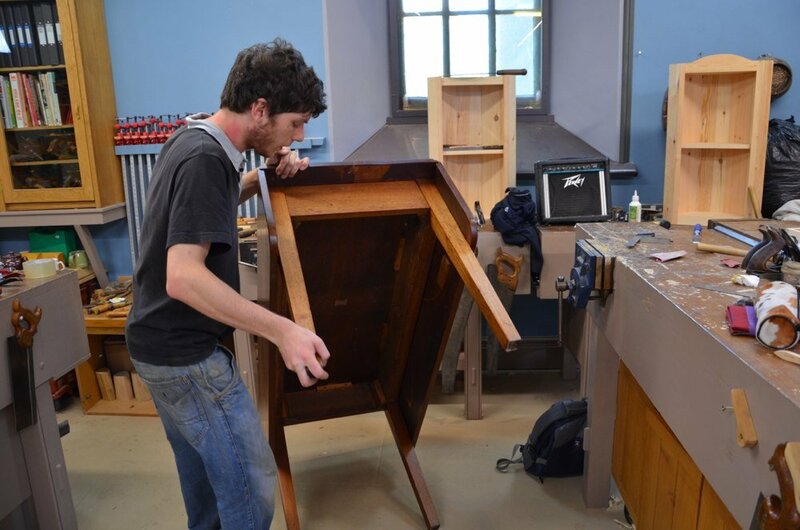 I like the concept and visual appearance where the top cabinet fits to the base frame but they would it would have been better increasing the apron width and also leaving more meat at the top of the mortise pocket between the top of the tenon and the top of the leg. 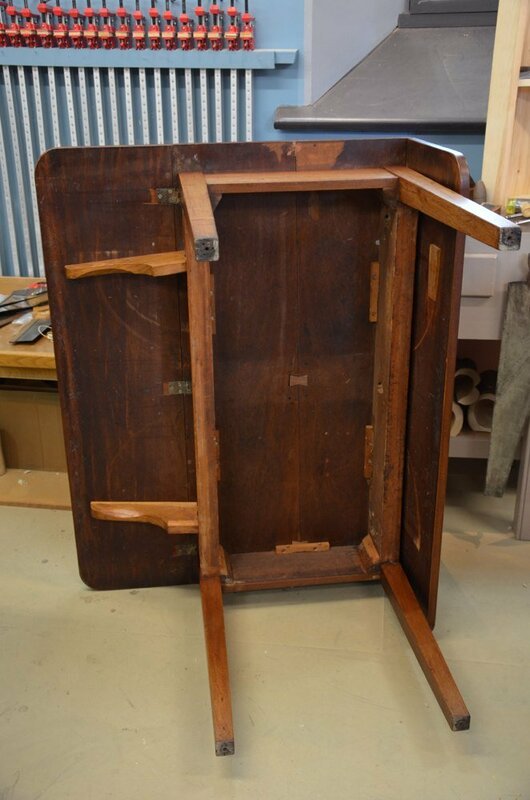 I am sure all would have been OK had the glue or joinery not failed, but all joinery details and sizing should be decided on with repair and restoration being considered as possible after long-term usage. I always consider my joints might one day be X-rayed for authenticity or establishing details inside. It’s just vanity really. 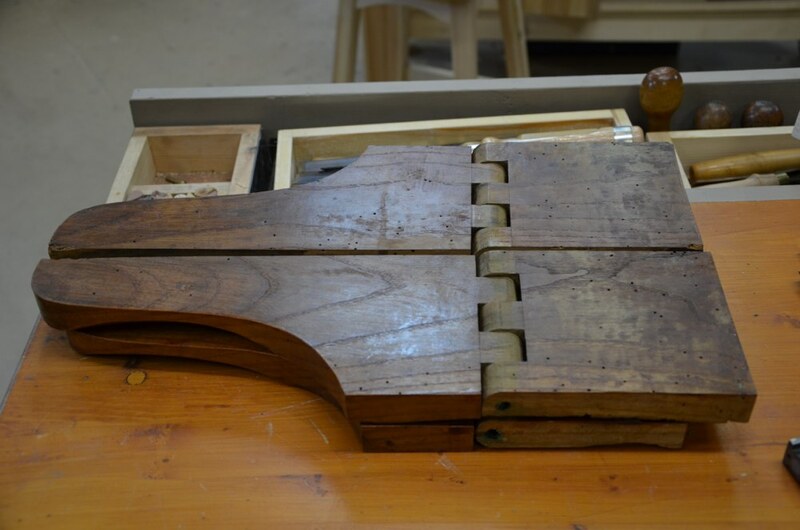 My next part in this will be returning to the mahogany table and examining the use of the knuckle joints. Someone asked me for a picture so here it is. I think we are planning a possible break but nit firmed up as yet. What are your dates? 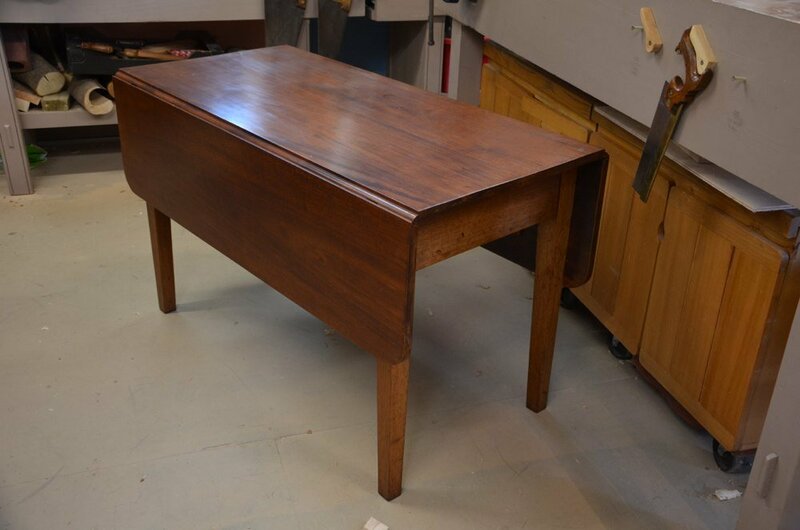 Paul, is it possible that the base of the writing desk was cut down from a different piece with the top carcass being added after the cut-down? Also, those worm holes in the knuckles of the table are somewhat disconcerting. I have heard of this problem from other UK sources. Is it a problem we face here in the States as well? If so, how can it be avoided? No, everything else is well synchronised and the top box section fits very nicely. Worm holes are a common aspect of UK life in old an antique pieces like this.Some woods are more appealing to the tiny beetle, oak, ash, elm and some softwoods too. We can deal with it chemically and effectively IF its not gone too far with lots of unseen activity beneath the surface so as to weaken the material too much. You already have worm problems in the US with powder-post beetle and others. I recall a friend installing a brand new kitchen in the US and a few weeks after installation having to treat something he had no responsibility for.Wood beetle attack can happen but it’s less likely than likely depending on where you live and what you bring into your home or shop. Some beetles land on bark and need the bark to breed on and lay their eggs in. Long horn borers for instance. The eggs hatch and the grub or worm enters the wood as a tiny entity and then grows as it works chomping through the wood. Other beetles just find a crevice in a joint to lay their eggs in it. They travel along the cells and then as they grow they work in any direction randomly. After seeing the picture of the knuckle joint it made me think of something that Roy Underhill of the Woodwright’s Shop made. It was The Roubo Bookstand. It has a knuckle joint and the whole thing is made from a single piece of stock. I was curious if you’ve ever seen the video of him making it? It’s really kind of amazing how he basically makes a hinge without a pin. This is a link to the video if you haven’t seen it and are interested in it.